Tilted gingerbread houses, baroque apparels, lustrous colors, faces with big eyes that both laugh and cry, not to forget majestic animals which speak with human tongues: such are some of the ingredients of a child’s nativity set imagined by adults. Heather Goldminc’s precious ceramic nativity reflects some of the typical features of contemporary Christmas tradition. It suggests an atmosphere of faraway innocence and childlikeness, of humor and sadness, of paradise lost. There also remains the silent hope of paradise retrieved.--Exhibition label originally written by Fr. Johann G. Roten, S.M. for exhibit entitled "At The Manger: No Place Like Home" held at Roesch Library, University of Dayton. 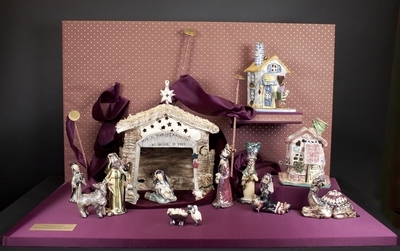 Glazed ceramic nativity set created by Heather Goldminc, an artist from Vancouver, British Columbia, Canada, around 2005. Figures include three kings or magi, Joseph, Mary holding the infant Jesus, one camel, one lamb, one shepherd, one stable, and two smaller buildings.